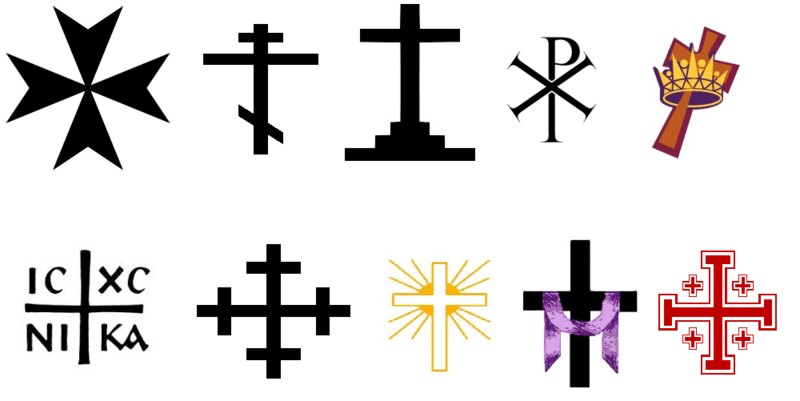 In the Spring of 2013 we began to explore the symbols of our faith. We began by defining what a symbol is: an icon that stands for/points to something else and invites us to act accordingly. This second half of our definition is not found in the traditional definition of symbol. We considered symbols that we saw in everyday life (stop sign, red light, brand logos, water, etc). Finally we began our exploration of symbols from our faith – where they come from and what they mean. We created a symbol gallery that can be seen on the EDGE bulletin board in the Eden Center. We also used a button maker so the youth could make buttons to wear with their favorite faith symbol. Anchor – this is an early Christian symbol that dates back at least to the martyrdom of St. Clement of Rome (1st century AD) and reminds us of our hope in Christ and that Jesus is the anchor of our souls. Torch – another early Christian symbol that reminds us that we are called to be the light of the world. Jesus is our light in the darkness and we are the light for others, called to witness to our faith (we had a long conversation on what this means) through our loving deeds and choices. Shamrock – this symbol was used by St. Patrick to explain the Trinity to Irish converts. Each leaf represents the Father, Son and Holy Spirit. Triangle – another symbol of the Holy Trinity. Wheat, Grapes, Chalice – symbols of Eucharist, our most blessed Sacrament, Jesus’ gift of himself to us that we can receive every time we go to Mass. Olive Branch – symbol of peace, reminder that Jesus is the vine and we are the branches, reminder that Jesus calls us to be peacemakers. Boat – a symbol of the Church. The Church was founded by Jesus to help us stay together and to be our safe haven in troubled waters. Fish – one of the earliest Christian symbols. This symbol was actually used far more by the early Christians to identify themselves than the cross. It reminds us of the stories of Jesus feeding the 500, and the road to Emmaus. Dove – symbol of peace, symbol of the Holy Spirit. The dove reminds us of Jesus’ baptism and Pentecost. Water Basin & Pitcher – reminds us of Jesus’ Last Supper where he washed his disciples’ feet and commanded them to do as he had done. This symbol reminds us of our call to be servants to one another. Stone Tablets – remind us of the 10 Commandments. Jesus was Jewish and lived by these commandments and we are called to do the same. Star of David – the six points of the star remind us of the six days of creation. The Star of David also reminds us of the special relationship between the Jewish people and God, and reminds us of our relationship with our Jewish brothers and sisters. Sacred Heart / Immaculate Heart – the heart is a symbol of love, compassion and mercy. Often we see images of the Sacred Heart of Jesus and the Immaculate Heart of Mary. Palms – symbol of Palm Sunday and Jesus’ triumphant entry into Jerusalem. Palms were an ancient symbol of victory and triumph. Lamp – symbolizes the Word from God. From Psalm 119:105, “Thy word is a lamp for my feet, a light for my path.” When we hear the Word of God we are supposed to act upon it and follow it. Lamb – symbol of Jesus, the lamb of God who takes away the sins of the world. Keys – represent authority and leadership; symbol of the Pope and the keys to heaven. Holly – symbol of Jesus’ suffering. The holly reminds us of the crown of thorns and the blood of Jesus. The Good Shepherd – Jesus is our shepherd who finds us when we are lost and lay down his life for us. Eye of God – reminds us that God is all knowing and all seeing. Can be found on the back of a $1 bill. Think of the eyes of a loving parent watching over us. Bells – symbol of evangelization (spreading the Good News); bells were used in many communities to call worshipers together. Often also used during the Eucharist to remind worshipers to look up from their prayers and witness the bread and the wine transformed into the body and blood. Candles – symbol of Jesus as the light of the world. Shell – symbol of baptism; shells were used for baptisms at rivers or the sea for scooping and pouring the water. Angel – a messenger from G0d; appeared to Mary and Joseph and throughout the Bible. Eastern Cross – top arm symbolizes the INRI (the sign placed above Jesus’ head at his crucifixion), second arm represents where Jesus was nailed, the slanted third arm represents the resurrection. All three arms together represent the Trinity. Calvary Cross – three steps symbolize Jesus’ walk to his cross and symbolize the three virtues of faith, hope and love. How many of these symbols do you see every day? Where do you see them? What do they mean to you?